Pope Francis has held virtual audiences, tweeted to millions of followers, and sent video messages on Instagram — this week he ventured further into the world of digital social engagement when his first “TED Talk” was published online. TED, which stands for Technology, Entertainment, and Design is a nonprofit devoted to spreading ideas, usually in the form of short, powerful talks with live audiences that are also published online. TED began in 1984 as a conference where and today covers almost all topics — from science to business to global issues — in more than 100 languages. 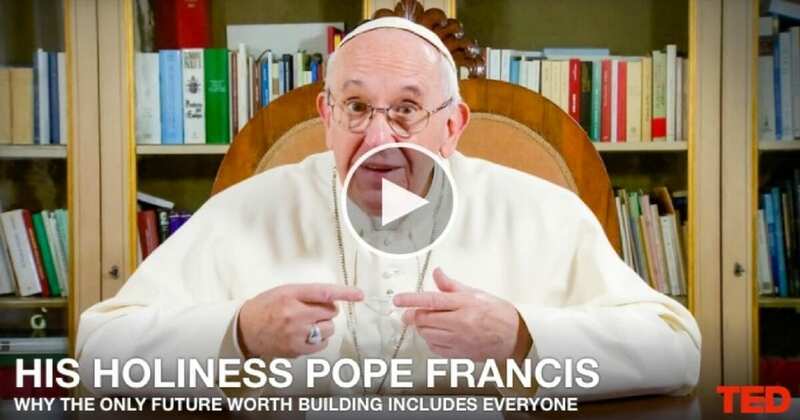 Pope Francis’s talk entitled “Why The Only Future Worth Building Includes Everyone” was recorded earlier this month with him speaking in Italian, but the talk is available with subtitles in more than 20 languages including English, Spanish, and Arabic. The Pope lays out three key points in the 17-minute talk: 1. That we all “need each other” and the world’s challenges are best solved together; 2. Using the story of the Good Samaritan, he emphasized the importance of living out the value of solidarity and that the fields of science and technology could play key roles in responding to the realities of social injustice; and 3. He called for a “revolution of tenderness” — challenging people to see and hear the other and respond with words and actions of love. Chris joined the Ignatian Solidarity Network (ISN) as executive director in 2011. He has over fifteen years of experience in social justice advocacy and leadership in Catholic education and ministry. Prior to ISN he served in multiple roles at John Carroll University, including coordinating international immersion experience and social justice education programming as an inaugural co-director of John Carroll’s Arrupe Scholars Program for Social Action. Prior to his time at John Carroll he served as a teacher and administrator at the elementary and secondary levels in Catholic Diocese of Cleveland. Chris speaks regularly at campuses and parishes about social justice education and advocacy, Jesuit mission, and a broad range of social justice issues. He currently serves on the board of directors for Christians for Peace in El Salvador (CRISPAZ). Chris earned a B.A. and M.A. from John Carroll University in University Heights, Ohio. He and his family reside in Shaker Heights, Ohio. Genuine tenderness, mercy, compassion and love are priceless treasures.